SpayAware is urging men to help end the nation’s deadly toll of unwanted cats and dogs – by tackling their pet’s tackle! The challenge has been laid down by TV Vet and SpayAware campaigner Pete Wedderburn, who wants the traditional male to rethink his attitudes to pet ownership in response to SpayAware’s recently launched ‘Real Men Neuter’ campaign. “It’s time for men in Ireland to help end the nation’s deadly toll of unwanted cats and dogs – by tackling their pet’s tackle!” says Pete, who works with SpayAware to highlight the importance of spaying and neutering to address Ireland’s pet overpopulation crisis. In a bid to change views, SpayAware is this year taking a fresh approach by targeting men in its annual poster campaign. 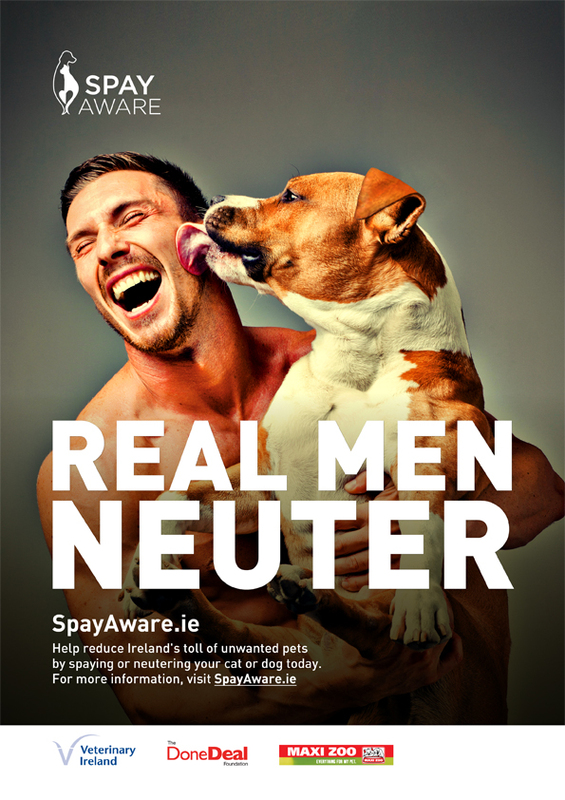 Bearing the message “Real Men Neuter”, the poster encourages them to play their part to end the destruction by spaying or neutering their pets. Pete Wedderburn explains that in many countries including Ireland, men are among a key group of owners who do not believe in spaying or neutering their pets. “Many men tend to project their attitudes and feelings about masculinity and virility onto their dogs, with the result that they refuse to have them neutered,” he says. The “Real Men Neuter” poster (attached) is now currently on display in hundreds of veterinary clinics, MaxiZoo stores, and other locations around the country. It can also be viewed on the DoneDeal website, LoveMyPet.ie and is available as a download from spayaware.ie. While there has been a significant fall in the number of dogs destroyed in Irish pounds over the past ten years, most recent figures from the Department of the Environment show that over 4,500 dogs were destroyed in 2012. No official figures are available in relation to cats but anecdotal evidence strongly suggests that there is an even higher death rate amongst abandoned felines. The toll of unwanted pets would be much higher but for the efforts by animal welfare charities to find them new homes. The DoneDeal Foundation is committed to creating meaningful change in the community, through social, health, educational and environmental measures, and by investing in direct support services, research and advocacy for older people, adults, children and animals. Its PetAware Project promotes responsible pet ownership and advocates adoption of animals as a first choice over purchase. 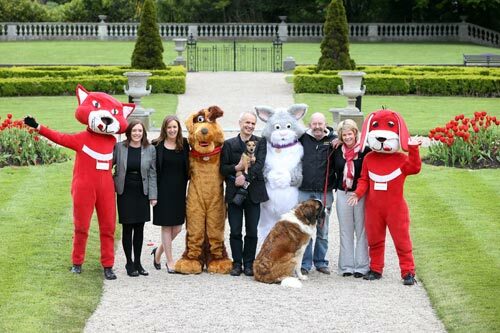 Pete with volunteers from Ash Animal Rescue Group, Kiltegan, Co. Wicklow, staff from the Radisson Blu St. Helen's Hotel, Stillorgan, Bud and Spud and MaxiZoo Dog and cat at the launch of SpayAware 2013 at the Radisson Blu St. Helen's Hotel, Stillorgan, Dublin. Created and developed by a team of professional people who have given their time on a voluntary basis, our new website is designed to provide wide-ranging information on all aspects of spaying and neutering, including not just its importance to ending the overpopulation crisis, but the health benefits for dogs and cats. It also serves as a permanent informational resource. Our new poster challenges traditional myths, misconceptions and prejudices around the spay/ neuter debate with the challenging message “Real Men Neuter.” Downloadable versions of the posters are available. 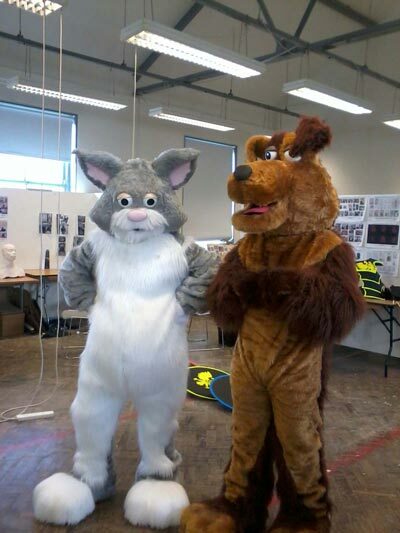 ....and these "Bud And Spud" suits were specially made for the campaign by students of the Institute Of Art and Design in Dun Laoghaire. 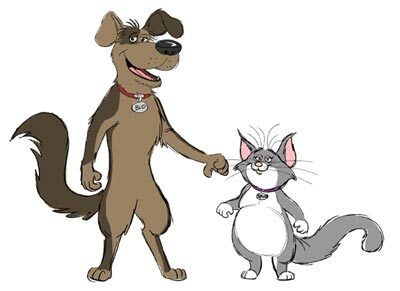 We currently have three television ads in production, two featuring well-known people and the third animated cartoon characters Bud the dog and Spud the cat, specially created to promote the SpayAware message. They have even jumped off the screen in the form of lifesized costumed characters! We would be delighted to hear from any company or individual interested in supporting us by sponsoring these ads. Over recent times, SpayAware has been working closely with a wide range of organisations to promote our message. We are especially grateful to Veterinary Ireland (representative body of the country’s vets), the DoneDeal Foundation and Maxi Zoo for their sponsorship and support. We would also like to thank Dogs Trust, The ISPCA and the Blue Cross, all of which support our goal and have contributed to our ongoing discussions. Finally, we would also like to thank the nationwide network of animal welfare charities and organisations, individual vets and concerned people who continue to support our efforts. 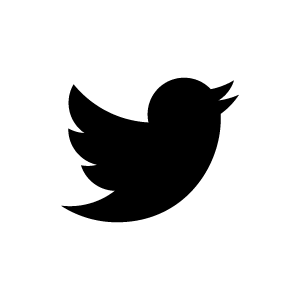 At a time when social media is in increasingly important communication tool, you can now find out more about SpayAware through our Facebook page or by following us on Twitter. Broadcaster Claire Byrne has launched a new initiative to end the needless destruction of the nation’s unwanted dogs and cats. Claire joined fellow broadcaster and TV vet Pete Wedderburn for the launch of SpayAware, which aims to reduce the annual toll of healthy cats and dogs destroyed in Ireland by persuading more owners to spay or neuter their pets. The Primetime presenter recently set a good example by having her pet Labrador ‘Rosie’ spayed. Speaking at the SpayAware launch at the Radisson Blu St Helen’s Hotel in Dublin, Pete said the best way individual pet owners can help end the killing is to ensure their cats or dogs are neutered or spayed. As part of a fresh approach to the issue, he explained that SpayAware is seeking to target its message at owners who, for a variety of reasons, do not believe in spaying or neutering their pets. “There are a lot of myths and misconceptions around spaying and neutering,” he says. “Many owners still feel that it is somehow better to let nature run its course, but the reality is that in the vast majority of cases, the spay/neuter option not only avoids breeding unwanted animals that will end up being put down, it is also better for their pet’s long term health. Our advice to owners is to discuss the spay/neuter option with your vet today. In a related development, SpayAware has welcomed the passing by the Oireachtas of the Animal Health and Welfare Bill. “It is over a century since the previous animal welfare legislation was passed, so this new act is very welcome,” says Pete Wedderburn. “There are many aspects to the new legislation which will strengthen the battle against animal cruelty.” President Michael D. Higgins is to sign the new bill into law in the coming days.